"So how are you getting to Penn Station?" We had just gotten on the 6 heading back to Manhattan after the race. This seemingly innocent question was raised by Yeoman "Abby" Kelly. "I thought I'd switch to the yellow line at 59th, and then take the 1, 2 or 3 to Penn." There was much tetching and shaking of heads. Kelly informed me that even saying "yellow line" marked me as a subway newbie. "You should go to 51st and take the E. You don't want to have to change trains twice." Commander Jory and Lt. Zoraida agreed. My plan was flatly foolish. Even if I was to take the N-R-W subway (see, I know what trains are on the "yellow" line) I should get off two blocks from Penn and walk rather than foolishly changing to the 1-2-3. After a bit of protest I finally gave in, after all they live in NY and I'm from LI. They should know the subway better, right? The first hint I had that this might not be the case is when we pulled into 145th Street station half an hour later. I asked if I should switch to the express here, and Jory, glancing across the platform and not seeing the train right there, dismissed the idea (with much nodding from the others.) On our way to 51st, the express passed us. And another. The second time I pointed this out and Jory explained, "It's a crap shoot." Here's a hint: when you are going from 145th to 51st on the local 6, stopping at 56,297 stations along the way, the odds of an express train passing you are not a "crap shoot" unless your dice have nothing but 3 and 4 pip sides. Captain's note: The "crap shoot" part is not whether or not an express train or two will pass a local 6. Instead, it's whether or not a whiter-than-white boy from Long Island wearing, of all things, a Star Trek emblem on his chest would live long enough (forget about prospering) on a 145th Street subway platform waiting for an express to arrive. You were guided well, Kurt. Still, I dutifully got off at 51st and walked with Jory and Zoraida to the E line. A Queens-bound train arrived as we went down the escalator to the bowels of Manhattan, so they bid me adieu and I took up my position on the Manhattan side of the platform. After ten minutes I noticed the pipe next to me was dripping, and on the floor a small stalagmite had formed. "Wow," I thought. "How long has that thing been dripping to make a stalagmite that big?" Little did I know I would find out. Five minutes later another Queens-bound E train arrived. The hundred or so other people waiting on my side started to shuffle about and get frustrated. Another five minutes and a Queens-bound V train stopped. I noticed the stalagmite had grown visibly. Or maybe I was just sinking into the Earth via erosion. So I, and 150 other commuters who probably also trusted their so-called friends, trudged back up the infinite stairway (escalator shut down for your convenience,) and walked back to the 6 where I waited on a very-crowded platform for the next train. Another 10 minutes wasted. Once I got to the N train, (3-minute wait), crossed town (less than 5 minutes), walked to the 1 (one-fifth the distance from the 6 to the E) and caught a ride to Penn (1-minute wait) it was a simple trip home. Only an hour later than if I had foolishly gone with my original plan. And hey, maybe by next race the statute of limitations on that kicking will have run out. After towing the Race Committee boat by tractor beam to the starting area, the crew of the Starship Enterprise assumed their positions for Race 13 of the Wednesday Night Race Series. All crew were present and accounted for, even Lt. Kurt (wow,) except for soccer star Crewman Luke (whose knee apparently can't be bent like Beckham's) and Lt. Commander Mitch, who was trapped fulfilling domestic duties in Cape Cod. Almost missing the night was Lt. Jonathan, who was very late and only brought a single copy of his new book for Commander Richard only. The book, focusing on how to double ones income, probably details how to work more hours by showing up late to racing. Our start was close to perfection, despite a bold maneuver to avoid a couple of non-spinnaker boats in the starting area. The Enterprise soared upwind and rounded first around the windward mark. Our take down was perfect as we jibed around the last mark and in no time at all, we were at Warp 7 heading towards the finish line - never seeing the stern of a single boat in our division. So why did we do so well tonight versus every other night? What was different? What was missing last night that's usually there each other night? Initially, we thought it was Mitch. But, after careful analysis by Mr. Spock, I mean Mr. Kurt, we find the problem is not with Mitch himself per se, but rather with his gigantic yellow duffel bag. Last night's race started with a few members of the crew attempting to adjust the secondary warp core stabilizer (adjust the uppermost batten in the main sail.) The adjustment required the use of special tools all at arm's length and it was during that adjustment that I heard multiple requests for magnifying reading glasses because, apparently, the ones doing the job were experiencing some focusing issues due to, dare I say, age. Between eyesight, arthritis and domestic issues, the entire crew, with perhaps the exception of Yeoman Kelly and Crewman Olivier, are beginning to show symptoms of the affliction that seemed like only a few years before only belonged to Commander Richard. But don't count us out yet. Well, not ALL of us. When it comes to tacks and jibes and moving around the Enterprise in light air conditions, the crew proved that they can move as well as anyone. Or at least any 40 year-old. Back to last night's race. We had a perfect start followed by an exceptional first upwind leg, rounding the first mark just behind Chaika. Our spinnaker set was just about perfect and included a textbook jibe, putting some distance between us and the rest of the fleet. We even GAINED ground on Chaika! If only that were the finish. But, the wind got lighter and the engineers on board decided to compensate by adjusting the primary warp manifold by a micron. Except, in this case, the manifold was a genoa car and the micron turned out to be a good six inches. The Enterprise was pointing about 10 to 15 degrees lower than everybody else and we lost a ton of ground on the third leg. Oh well. After all, we are still learning. Or it's an age thing. Thankfully, our spinnaker skills were once again phenomenal including two (yes two!) flawless jibes. We gained ground and were able to take back some of the lost footing. All in all, a job well done. There's only four races to go in the series - so be sure to tune in next week for some more jibe-talking, centerboard-dropping, tequila-swilling, boxed-wine-pouring, June-narrating and orange-goop-eating action. With several important people in key positions missing last night (as well as a few non-important ones -- you know who you are,) the Enterprise went out to the starting area in high hopes that there would be enough of a breeze so that we wouldn't have a third race in a row cancelled. Our start turned out to be all right, despite the puff moving across the starting area giving the Enterprise a boost in speed and throwing off our timing. We were at the pin at 0:00, but, most of that is thanks to some tricky S-maneuvers and the fact that there were no boats below us. Backstay/batten conflicts arose as usual in light air, so our tacks were not as textbook as we hoped, but we were still pleased to cross tacks with Chaika on the first leg. 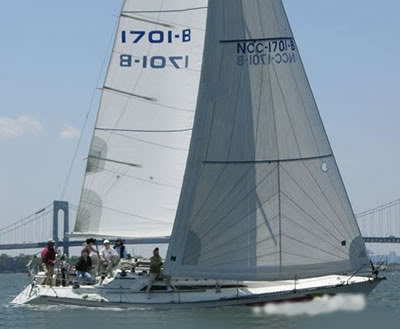 Following a rather tricky mark rounding (we missed it by THAT much,) we rounded in second place and held position all the way downwind into the current-filled Eastchester Bay. We lost some ground in the final upwind leg, but still managed to finish in third with no correction factor changing our standing. We finished the evening at Dempsey's, where we, for Lt. Zoraida's sake, were on the lookout for approaching taxicabs and Lt. Jonathan revealed that he went to school for electrical engineering, the same degree my father, Commander Richard, had obtained. Of course, back then, electrical engineering consisted of calculating how far from the kite do you tie the key. Most of the crew feasted on the 20-cent chicken-wing special, which, of course led me to wonder what do they do with the rest of those little chickens. 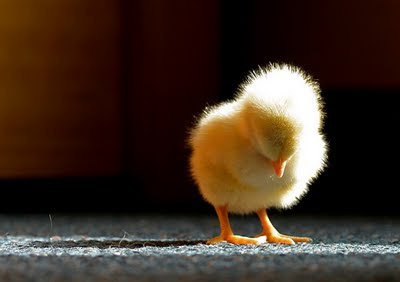 You never see tiny chicken thighs or tiny chicken breasts. Poor little chickens. Bon apetit, crew. With an amazing first-place victory under our belts from the ultra-stormy CIYC Day Race on Sunday (where damp was the new dry,) the charged-up crew of the Enterprise was ready for action. Unfortunately, the wind gods around Eastchester Bay did not share the same enthusiasm. Upon arrival to the ship, we saw winds speeds of 1.6 with whopping gusts of 2.2. 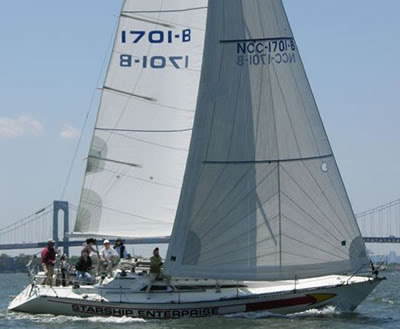 Once again, the crew used the same excellent foresight they used in not competing in the Around Long Island Regatta by not running the spinnaker lines and keeping the sailcover in place. I decided to give the impulse engines a good workout and we took the Enterprise out to the starting area to offer greetings to our friends, collect my one dollar from the USS Tolo and simply enjoy the fact that, even with no breeze, it's still better than being in the office. So, we puttered around for 45 minutes. We asked Tony Sklarew of Alviento what his battle flag flying from his forestay read. We had Roy Halvorson of Crossbow pass us twice as he couldn't get enough of looking at my white clean bottom (insert your own joke here.) And, when we passed Vince and Wendy on Fantasy Girl (baby strapped to the foredeck) they stated that they were having trouble calibrating their wind instruments and if we could be so kind as to give them what we were reading. As the Enterprise glided through the glass-like water, we happily replied "22.5 knots" and went along our merry way. We went back to our standard-orbit mooring and, in no time at all, the boxed wine and the Enterprise's new signature drink, Rum and Diet Pepsi, was flowing. In no time, we were re-living our adventures from the past weekend and previous storms. Lt. Jonathan, after his wife put the entire northern district of the US Coast Guard on Search and Rescue alert during last Sunday's race, wanted to know who would contact his family should he suddenly become fish food. Turns out there were several volunteers willing to deliver the news to his wife. But who would tell Courtney?